Drawing by Renae De Liz. Borrowed by Andy. 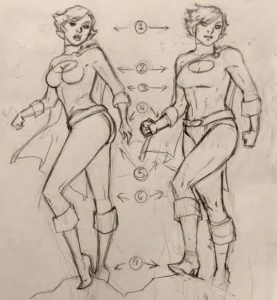 In a series of tweets compiled by Heroic Girls, cartoonist Renae De Liz gives a terrific, thoughtful overview of how to think about – and address – objectification of female characters in superhero comics. And Geezum, does she select a great character to use as an example: Power Girl. De Liz’s discussion provides great insight into the changing culture of comics fandom and – in reviewing the comments – the sexism that continues to be persistent in it. Give it a read here: How To De-Objectify Women in Comics: A Guide.